We help you prepare quality legal documents. In Trust Legal is the perfect solution between questionable online generic forms and the high cost of legal fees. It has been said that justice is too expensive. Who wouldn’t gulp in fear when thinking about hiring an expensive attorney? The idea of doing it yourself can be confusing and overwhelming! Where do you find the right forms? Are online sources reliable? Will you know which documents are the best for your circumstances? We all deserve to have quality legal documents without incurring thousands of dollars in legal fees. In Trust Legal offers affordable legal documents. We provide our clients with legally enforceable documents, written and approved by lawyers. In Trust Legal gives you that personal approach by working with you every step of the way. If you know what you want and are not seeking legal advice or a legal opinion, then why pay for it?! Let In Trust Legal help you help yourself. Carol assisted me in updating and changing several items in my revocable trust. We met for an initial consultation, and she provided excellent recommendations relative to the work that needed to be done. She was also precise with cost estimates. After consulting with all parties involved, we met again, and she prepared and notarized my documents and assisted me in organizing my trust manual. Her office is very organized, and she executes in a very concise and organized manner. 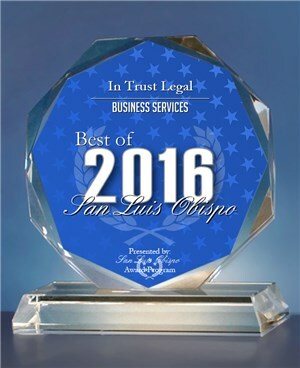 I highly recommend In Trust Legal. I needed something notarized and was in San Luis on a Tuesday. Found them on yelp and called to see if I could come in without an appt. no problem. Tip- there's parking behind their building which makes things easier, just enter on the Monterey. The woman who helped me was VERY knowledgeable. Helped me fill out my form regarding my moms estate and helped me figure out what was best for our situation. Carol is thorough, reliable and a pleasure to work with. She is also very knowledgeable and has a manner which puts one at ease in any situation. When Carol says she is going to get something done, she does it on time and without mistakes. She helped us with our trust documents much more efficiently than anyone has in the past. Top notch professional! I met Carol over a year ago at a SLO Chamber Mixer and I knew right then that she was what I was looking for. I wanted to get my Family Trust in order and have my estate dialed in for the next generation. When I met with her she was patient, professional and encouraging. It only took a few weeks and the whole package was complete. Plus she is warm and fun and somebody I look forward to seeing. I even took advantage of the "make changes" benefit that she provides which gives a person a chance to make changes within the first year. I now feel great about having taken responsibility for my future and beyond, and Carol made it painless and affordable. I feel like i saved thousands of dollars going through her. Her prices are reasonable and the confidence when it is all said and done is priceless. Carol came to my rescue over the holiday season, when no lawyer wanted to help me draft a sub lease agreement. I knew of Carol through the Chamber of Commerce Ambassadors Committee and I knew exactly what I needed, I just didn't know how to structure and frame the language. Carol was great, I think I gave her the project the day before Christmas Eve and she got me a first draft! It was impressive and then she got the final draft to me within 24 hours of my final edits. I was impressed and will use her in the future for agreements, leases etc. Her experience and knowledge, combined with her work ethic are a great match. Plus she saved me a ton of money and time. Love it! Carol helped me decide if I should even proceed with a legal filing I was considering. I'd gotten some unclear information from the courthouse and she enthusiastically took on the research full steam ahead. She had an answer for me the very same day and even continued to research the following day for added clarity on the issue I was considering. Her follow through was quite impressive. She clearly has a passion for helping people, it comes through in her work. I will definitely contact her for my future legal needs. Carol was a big help and my document preparation. She definitely steer me in the right way of getting everything prepared. I was very fortunate to have her help me. 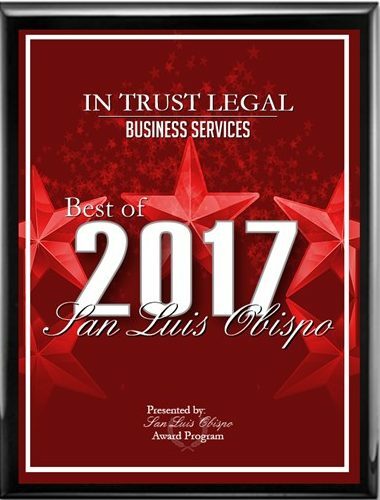 Carol Ramirez prepared a Living Trust for me as well as other legal documents for my business, all of which were done professionally and confidentially to protect my assets for my family and business. 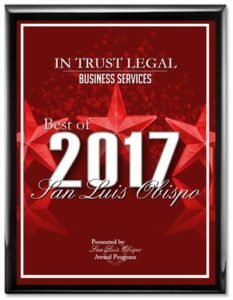 I would highly recommend Carol Ramirez of In Trust Service to anyone who needs legal documents without incurring the high cost of hiring a lawyer. I will hire her again for all my future business and personal documents, Carol is wonderful!! Do you know if your real estate will avoid probate? Get up to date on how to protect your assets and the ones you love.